The historic warm-weather doings are starting up around Old Sacramento. 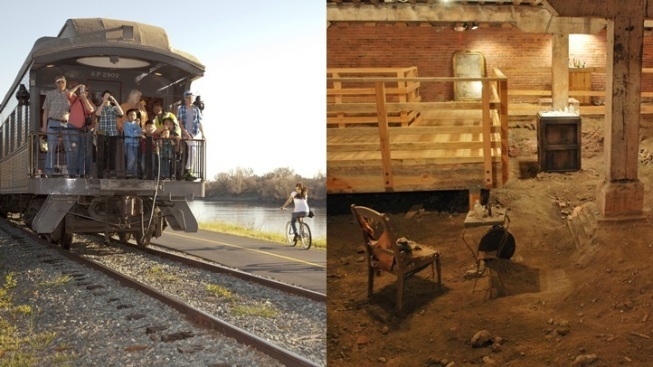 Hop aboard a steam train or go beneath the streets of Old Sacramento. Rides on the tracks and subterranean adventures are starting up for another season over the first weekend in April. FIRST WEEKEND IN APRIL: Though we play at summertime, a bit, in March, if the temperatures allow it (or at least mimic short-sleeve-y days), the official season beginner for getting outdoors is truly April. For sure, there may be showers, here and there, and damper days, but gardens are abloom, boats are abusy, and people who savor sunshine (pretty much all people, then) are looking for reasons to be out from under a roof. Old Sacramento State Historic Park is one of the first destinations out of the proverbial warmer-days-are-here-again gate with its annual kick-off of weekend train rides. The excursions have been around for three decades and two years, so this tradition of welcoming finer days is now truly multi-generational. But adding to the toasty time adventuring? Old Sac is also opening those ever-popular peek-beneath-the-streets Underground Tours starting in April as well. SACRAMENTO SOUTHERN RAILROAD: Opening weekend is Saturday, April 4 and Sunday, April 5, so dig out your conductor's hat and stripe-y overalls -- or just any comfortable outfit -- and choo-choo chugga chugga your way to Central Pacific Railroad Freight Depot in Sacramento. A vintage steam locomotive is at the lead, and there shall be occasional Diesel Days through the summer as well. Have a tyke in the house who is super-into trains? As if there were any other way to be into trains beyond "super-into"; truly, that's the level of passion that's standard. Get your rail-riding info here, trainees. OLD SAC UNDERGROUND: Anyone who has spent ten minutes strolling about Old Sacramento can see that stuff -- "stuff" being buildings, streets, lamps, and so forth -- is very well-preserved. But even better preserved, if you can believe it, is the stuff beneath the streets, which has stayed almost hidden, save recent tours, for a century and a half. Peek back at Sactown's wild/wooly social life in the 1800s on this go-below tour, which involves subterranean snooping at its finest. And look at that: The Underground Tours also open the first weekend of April. Perhaps summer really is just moments away.